This week's website of the week goes to Sentral IT. 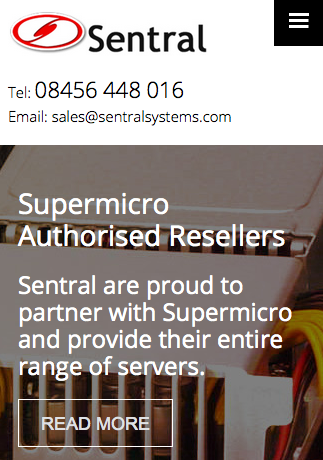 They are an authorised reseller of the entire Supermicro range of products. 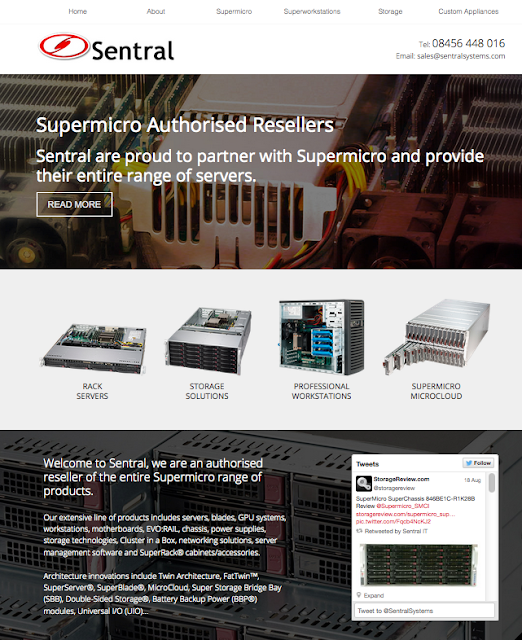 Supermicro are the leader in server technology innovation and green computing, provides customers around the world with application-optimized server, workstation, blade, storage and GPU systems. Sentral IT had a clear brief. They wanted something professional, modern and responsive. Project Manager Andy started off by creating a first draft that incorporated a full width panel layout, which gives the website an "open plan" feel. Even though the pages are content heavy, it's easy to take in and skim through if preferred. This is a very modern style of design that is favoured by those looking for something really contemporary and high end. When it comes to a business like this, it's important to get the right balance of content and visual imagery. People like images to break up word heavy pages, and the panels are the perfect way of doing this. The images have been carefully selected to represent the businesses product range, and people can see exactly what it is that they'll be buying. When you head to the internal pages, you can see that they are much simpler and stripped back. Using a clean white background, this means that the important information and content is easy to read, and is presented in a professional unfussy way. Looking through the pages, you can see that each one has been carefully thought out, depending on the subject matter. and products. The entire website uses a Google font called 'Open Sans,' which is a nice balanced font. It's not too formal and it doesn't come across as too informal either. It's easy on the eye and matches the overall brand. Sentral IT knows that their customers are likely to research and read reviews on the products before buying. This is why their testimonials page is the best marketing tool for them. Having their testimonials displayed on their website means that people can sift through them and get an overall feel for the company and what other customers have experienced. This is a very candid and transparent way of gaining potential customers trust, as they are able to read information from a reliable source. The client was pleased with the end result, saying that they thought our "Customer service is outstanding." We're really pleased with the end result.